Patriotic and controversial Nollywood actress, Tonto Dikeh decided to celebrate Nigeria at 53 in grand style. Tonto Dikeh has been trying out different hairstyles for some time now, from blonde, to weaves, to braids and back to blonde. For Nigeria’s independence day celebration, Tonto decided to rock green and white afro hairdo, representing the Nation’s historic colours. 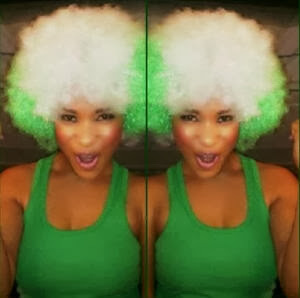 Even Tonto Dikeh loves her country.